Apple's stock price on Tuesday hit a new record of $143.80, eclipsing the $1,000 per share pre-split benchmark, and if it keeps pace for the rest of the week will beat the company's old market capitalization record. At about 1:00 p.m. Eastern time, Apple eclipsed a $1,000 per share valuation corrected for the split. At $143.80 at the close of business on Tuesday, Apple sits only $3.62 away from breaking the old market capitalization record, briefly reached on Feb. 23, 2015. Apple's market capitalization broke $700 billion on Feb. 14, and currently sits at $755.74 billion. Since the start of 2017, Apple's stock has climbed from $115.82 to Tuesday's high. Other than some recent analysts' predictions about the future of Apple's stock price, it isn't clear what drove Tuesday's rally. 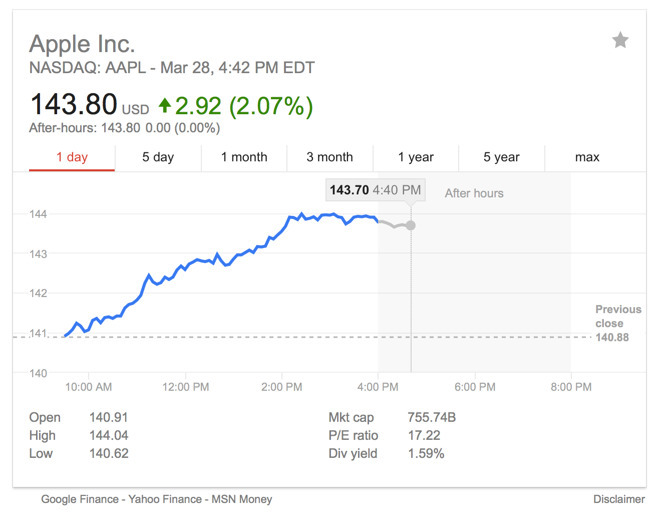 AAPL outperformed the market, which rose only 0.6 percent on the day with moderate trading value. A peak on March 20 was said to be on the strength of the next day's product releases, which turned out to be an inexpensive 9.7-inch iPad, a (Product)Red iPhone 7, and an iPhone SE with double the storage. Analysts suggest that Apple's share price can climb far higher in fiscal year 2017. While some suggest Apple could climb to between $140 and $150 per share. UBS analyst Steven Milunovich said in a research note that Apple's Services arm is undervalued by investors, compared to other parts of the company, and between it and a "super cycle" in the fall involving the "iPhone 8," Apple could see prices greater than $155 per share. Tuesday's all-time high follows a string of record-breaking trading days set over the past six weeks. The first record day of 2017 came on Feb. 13 when the stock hit a high of $133.29. Shares climbed $135.01 a day later as Apple's market capitalization exceeded $700 billion for the first time since 2015.